Pagsanjan Falls (also known as Cavinti Falls) is without a doubt one of the most famous waterfalls and most popular tourist attractions in the Philippines. 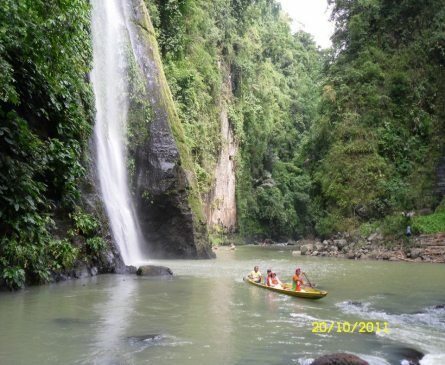 Located in Laguna province, the best way to see the falls is by river. This involves taking a two-hour canoe ride in which your skilled boatmen work incredibly hard dragging your wooden canoe through the rapids, and up to the main waterfall. The canoes usually accommodate two to three people, depending on the size of the individuals. 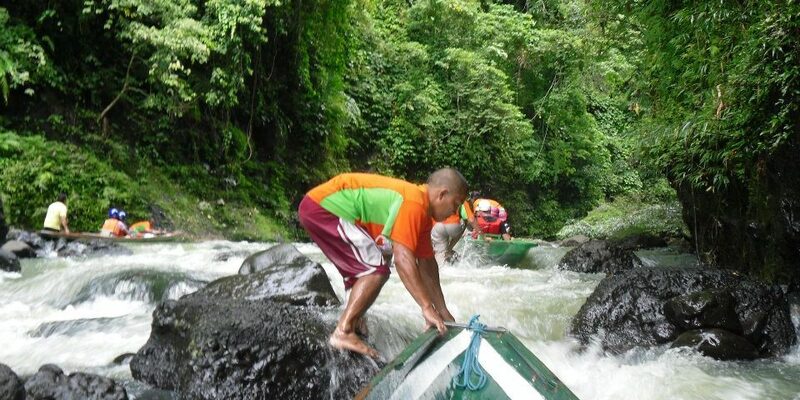 The boat journey is very relaxing, although rugged in parts, and takes you through the narrow Pagsanjan Gorge. This is lined with huge boulders, rocks and several small waterfalls trickling down the gorge walls. The surrounds are very peaceful as your boatmen gently paddle upstream. There is a place to stop about halfway along the way for a toilet break. Here you can also grab some light snacks like some chicken barbeque sticks, chips, soft drinks, or even beer. I know what I like! Whilst taking a rest here, you can enjoy the expressions on other visitors faces as they come back down through the rapids. Eventually, you arrive at the main fall, which spews into a natural pool below. There, you have an option to take a ride on a bamboo raft. This takes you through a thundering curtain of cascading water to the Devil’s cave, which is right behind the falls. The return trip downstream is referred to as “shooting the rapids”. This is an adrenaline-inducing ride through fourteen rapids as your boatmen manoeuvre your canoe through the narrow rocks. Make sure you keep your fingers inside the canoe or you could lose a finger! Pagsanjan Falls is just over a two-hour drive from Manila so can easily be done in a day. The hire of the canoe and two boatmen costs about P1500 per person. This also includes entry fee, life jackets etc. But don’t forget – the boatmen expect a tip on top of that. When you see how hard they work, you can understand why. A tip of P250per boatman is a reasonable gesture. One of the many rapids as you traverse up the river to the main waterfall. These boatmen work overtime pulling you up the rapids. This is not the main waterfall but is one of the many gently flowing single stream falls along the gorge as you make your way up the river. The sound of the water as it crashes into the basin below is deafening, This is easily the most powerful waterfall I have been to in the Philippines. Devil’s Cave, situated right behind the actual waterfall, can be reached by being pulled across the basin and under the waterfall itself on a bamboo raft. The power of the waterfall is something to be experienced. Please click below to watch my video of Pagsanjan Falls. The drive from Makati to Pagsanjan is about 90kms, and takes about 2.5hrs via SLEX and Calamba, heading for Sta. Cruz. It is important you check in at the Pagsanjan Tourism Office, as they will direct you to the river and find you boatmen. This is located next to the Pagsanjan Police Station. You can take a bus from the Buendia bus terminal in Makati to Santa Cruz, which takes about 3 hours. The buses leave frequently, and the bus fare is about P200. A cab driver in Manila should be able to direct you to the correct bus terminal. Once you arrive in Santa Cruz, take a jeepney to the tourism office in Pagsanjan for P30 and they will direct you to the river and find you a boatman. 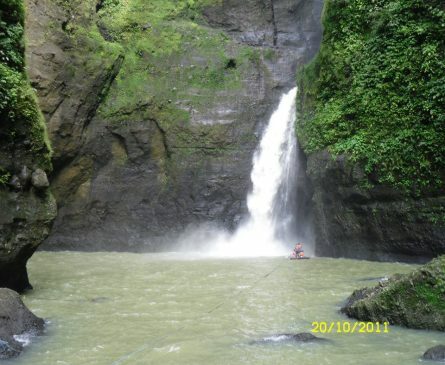 Although it is also possible to hike to Pagsanjan falls from the town of Cavinti, Laguna, it is recommended to take a tour package to take in the river experience. 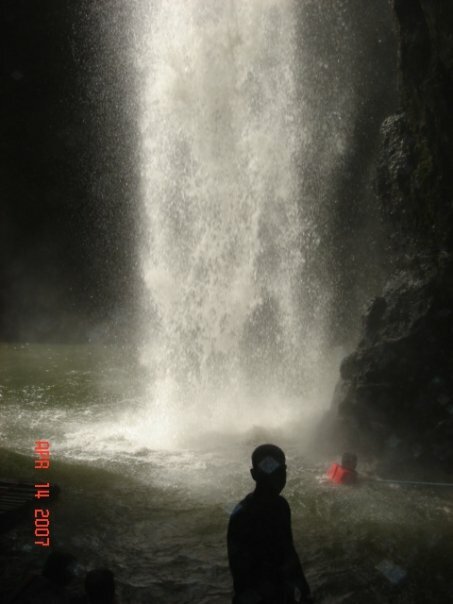 Most packages include round trip A/C van transfer from Manila, round trip boat ride for shooting the rapids and the raft ride to fully experience Pagsanjan Falls. It is important to note if you go without a package deal, you will be hassled relentlessly by locals to follow their recommended services. You must ignore these people and make sure you go through accredited Pagsanjan Tourism Office operators. One last thing – bring a change of clothes as you will get wet!